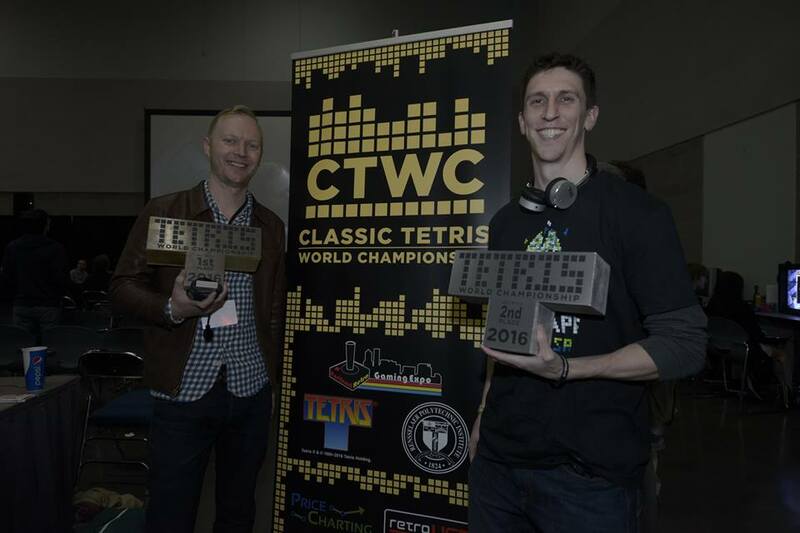 The 7th annual Classic Tetris World Championship (CTWC) was held in Portland Oregon last weekend. 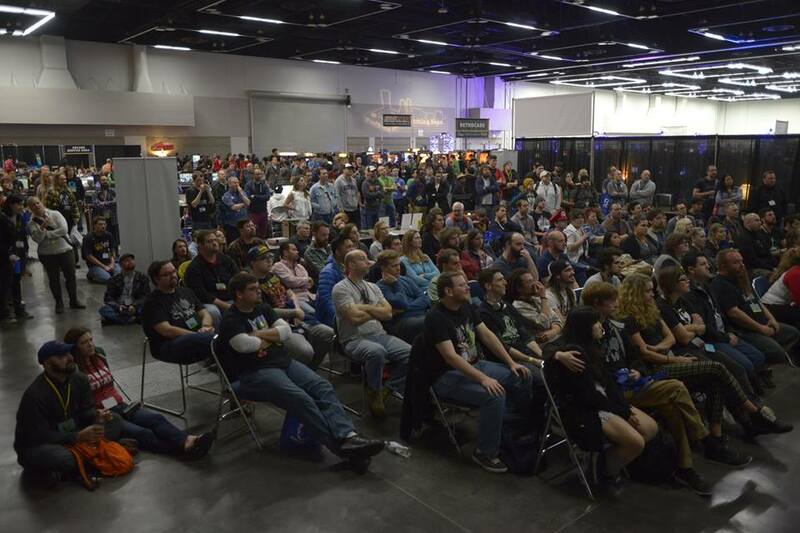 The tournament was organized by Vince Clemente, Adam Cornelius and Trey Harrison and was part of the Portland Retro Gaming Expo. 57 players paid a 15 dollars entry fee to participate in the main event which was a competition in Nintendo NES (NTSC) Tetris. Among them, 5 times winner and reigning champion Jonas Neubauer, 1 time winner Harry "SuPa" Hong, Jani Herlevi from Finland, winner of this year's Tetris European Championship NES (PAL) competion, and Koji "Koryan" Nishio, first player from Japan who maxed out NES Tetris (that means scoring 999,999 points). On Saturday, these players tried to score as high as possible to acquire one of the the 32 playoff spots. 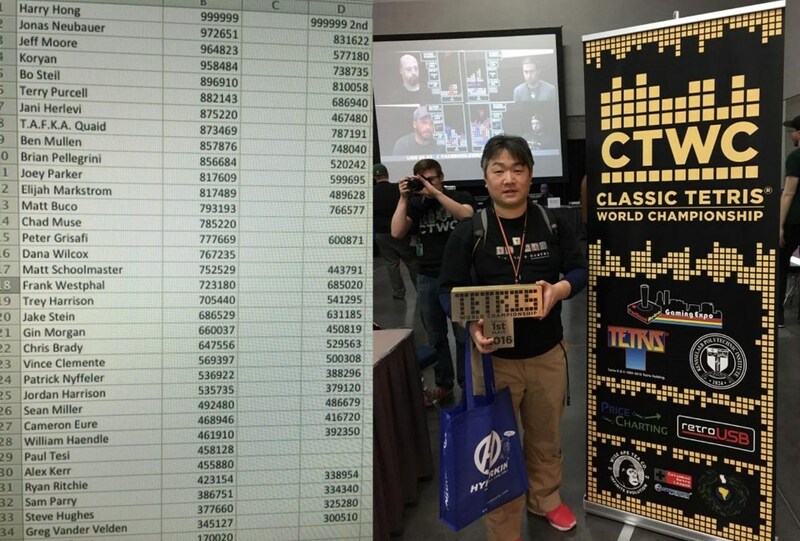 Harry Hong managed to score 999,999 twice and secured top seed for Sunday. For the very first time at CTWC, there was a TGM2 (TAP) competition. 8 players participated in it. Koryan and Alex "Kitaru" Kerr managed to beat invisible Tetris and faced each other later in a versus battle. Koryan came off victor and took home the T-shaped winner trophy. Also on Saturday, there was an amateur SNES Tetris (Tetris & Dr. Mario) versus competition. People who participated in the other 2 competitions were not allowed to enter. All matches on Sunday were streamed. Trey Harrison worked some magic (some kind of picture recognition) to enhance the relative poor output of CRT monitors for better viewing experience. The setup also displayed the length of an I piece drought if there was any. Also through ROM hacking, competing players received the same piece sequence (although playing on different consoles & TVs). Players usually started their matches on level 18 where pieces fall down 20 rows each second. After 130 lines they reach level 19 where pieces fall down 30 rows each second (using autorepeat becomes crucial). After 230 lines they reach level 29 where pieces begin to fall down insanely fast at a rate of 60 rows per second. Level 29 is also known as "kill screen" so players have to collect as many points as possible before that point. A Tetris (clearing 4 lines at once) scores 3 times as many points per cleared line as a Triple, so stacking for Tetrises is needed to score high but that is also very dangerous at level 19+. In a 1-on-1, the 2 involved players start their games simultaneously. The player who scores higher wins the game. A player has to win 2 games to advance to the next round. The first 2 rounds (top 32, top 16) were commentated by Adam Cornelius and Ryan Ritchie, the last 3 rounds (top 8, top 4, top 2) by Chris Tang and Jeffrey Wittenhagen. No big surprises happened in the first rounds. Eventually the 4 top seeds also made it into the top 4: Harry Hong was facing Jeff Moore, and Koryan was facing Jonas Neubauer. After a close win against Harry, Jeff faced Jonas in the final. At that point, they were playing infront of a crowd of far over 100 people, and over 1000 people were watching the stream simultaneously. First player to win 3 games becomes the next "World Champion". In the last game Jonas topped out prematurely but Jeff followed soon with a bit lower score. So, Jonas Neubauer won the CTWC for the 6th time in 7 years; alongside the trophy he could enjoy a prize money of 1000 $. Jeff Moore still got 500 $ for his 2nd place, and a trophy as well. Just to offer the perspective of someone to spoke to other tournament participants, It's not about "accepting" TGM2 so much as not feeling as confident or not having bandwidth to play alongside the NES qualifiers. Even established TGMers (cleure) did not have time to play in both tournaments due to how competitive the field of play was for NES this year. Others expressed they were eager to try out the game casually, but opted to focus on competition in the game they were more familiar with. The limited bandwidth for competing in multiple competitions was at its most suffocating in 2011, with a short qualifying period for both NES + PS3 1v1, with PS3 2v2 bracket participation taking a chunk away from this short time as well. If the qualifying period is expanded to take advantage of the new expo hours on Friday introduced this year, multi-game participation may become more feasible for those that chose to pursue it. forgot to mention: the NES folks didn't accept modern guideline Tetris either. In 2011 there's been PS3 Tetris and in 2015 Tetris Ultimate. In 2013(?) there's been a non-amateur SNES Tetris competion with around 20 players and many players competing in both NES & SNES. So obviously non-amateur SNES for the win. I think they only went for a TGM2 competition to have some footage for a second film (first film is Ecstasy of Orders). The NES folks didn't accept TGM2 which is not surprising at all. On the other hand, the NES folks would accept SNES Tetris (same rotation system, similar randomizer), so I don't understand why they went for an amateur SNES competition again.